Welsh Champions The New Saints (TNS) lost 3-1 in their home leg against Belgian champions Anderlect in front of a disappointing crowd of only 2486. TNS were Behind after 7 minutes thanks to a goal by United States international Sacha Kljestan, and soon after they found themselves 2-0 down; effectively ending the tie. Craig Jones gave the Welsh side brief hope when he made up for an earlier bad miss by smashing in Scott Ruscoe’s cross, but this only spurred Anderlect into further action and they made the game safe in the 73rd minute when Argentinian striker Martias Suarez scored their third. Despite effectively being eliminated now TNS have done brilliantly to get this far and it is sad that the people of Wales have failed to get behind them in this historic occasion for the club. Hopefully such apathy will not be repeated in the second leg and the Anderlect fans will turn out to help boost The New Saints earning from their European Adventures. Glasgow Celtic, who by their standards are having an indifferent spell of form have been handed a tough draw in the Champions League 3rd qualifying round, having to take on Portuguese league runners up Sporting Club Braga. Although not a widely known team outside of their home country Braga are past European winners having won the Inter Toto Cup in 2008-9 and last season recorded their highest ever league finish. Much of their success was down to their excellent home form, they won 14 of their 15 home games last season and only conceded 6 goals. Celtic are poor European travelers and will probably be thankful for the fact the 1st leg is away, so letting them know what they need to achieve in the second leg. They will take some confidence from the fact that Braga lost 5-3 on aggregate to Hearts in 2004, and last season were soundly beaten by Swedish side IF Elfsborg at this stage. However Braga have improved dramatically of late and with the addition of some talented Brazilian players they now have a squad which could make it to the group stages. If Celtic are to progress they will need to keep the away leg close and hope that a packed Parkhead crowd can roar them to victory, and given their current financial state failure is not an option as there is no Europa League group place for the losers of this one meaning another potential nerve racking playoff. If you had told the connections of TNS 15 years ago when they were in the process of stepping up from Amateur status that in the new century they would be playing against Anderlect in the European Champions League 3rd qualifying round you might have been asked what you had been drinking. However on Tuesday night The New saints will be flying the flag for Wales when they take on the Belgian Giants at Wrexham’s Racecourse Ground. Not that this will be their 1st big European night, having played Manchester City in the UEFA cup and most notably Liverpool in 2005. Despite being 3-0 down from the 1st leg in the home tie they gave Liverpool quite a battle with Steven Beck hitting a post and Marc Lloyd Williams having a goal controversially ruled out for offside. At this stage Liverpool were only 1-0 up on the night and although they eventually grabbed 2 late Steven Gerrard goals to make the score respectable TNS were never overawed. Anderlect are the reigning Belgian champions finished the season with 5 wins and a draw. So providing they come with the right attitude should be far too strong for TNS, who will do well to hold out for a draw. Much as we would like to see them progress the bookies have probably got it right making the Belgians 1/4 to win in Wales. However TNS will be well pleased with a nice cash windfall, which should help them continue with their impressive progression as a professional club. Tickets are only £10 and they are giving 2000 kids tickets away free if you fancy watching the match ring 01978 262129 to see if there are any tickets left. In front of a partly crowd of 1056 recently formed Welsh Champions The New Saints FC overturned a 1-0 first-leg deficit against Bohemian FC to reach the Champions League third qualifying round where they will meet Belgian Giants RSC Anderlecht. Three goals in the first 20 minutes courtesy of Craig Jones, Matthew Williams and Chris Sharp effectively ended the tie before half time, and Williams grabbed the 4th with 17 minutes to go so putting the finishing touches to their first ever aggregate win in Europe. 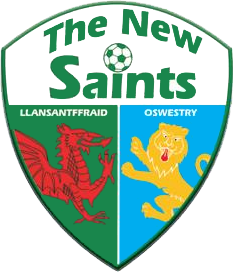 TNS who were originally known as Total Network Solutions prior to their merger with Oswestry Town are no strangers to big European Nights, despite having never previously won a European tie. In 2005 they player Liverpool losing both games 3-0, but attracting crowds of 8009 for the home leg played at Wrexham’s Racecourse Ground Stadium and an impressive 14,563 for the game at Anfield. In 2003 they lost 7-0 on aggregate to Manchester City in the UEFA Cup 1st Round, and they could meet them again if as expected they lose to Andertect in their Champions League tie. As 3rd Qualifying round losers they will still qualify for the Europa League Playoffs, which includes Man City and other British Clubs Aston Villa and Dundee United. Whatever happens TNS will end this season with a slightly higher profile and a considerably bigger bank balance that when they started. Linfield started this Champions League qualifier as 7-1 underdogs against Rosenborg, having rode their luck a bit to gain a 0-0 draw in their home leg and even their own players acknowledged that they would need a lot of luck to make it through to the 3rd Qualifying round for the first time. However with 30 minutes on the clock the fairy tale looked on for Linfield, when striker Brian McCaul found himself clean through on goal with only the keeper to beat. Unfortunately the “Luck of the Irish” was not with him and he lost his balance at the key moment shooting wide. Ironically within 60 seconds Radi Prica headed Rosenborg in front and the Norwegian titleholders never really looked troubled there after. Linfield did try to rally in the second half but never really threatened the Rosenborg goal and Markus sealed the Norwegians win in the 87th minute. Rosenborg will now play Sweden’s AIK who themselves just sneaked past Luxembourg side Jeunesse Esch. On Wednesday night Irish side Linfield will be hoping for one of their best results ever if they can beat Norewigen Premier League side Rosenborg who they managed to hold 0-0 in the home leg. Rosenborg have played in the Champions League second Group stages twice including a great campaign in 1999-2000. The chances of Linfield progressing look remote, so fans looking for a small team to support will have to look to either Bohemians or the Welsh side The New Saints who play each other on Tuesday so guaranteeing one Footballing Minnow gets a chance to swim with the bigger fish in the 3rd Qualifying round. Having failed to make the lucrative group stages of the Champions League last season New Celtic boss Neil Lennon would have been hoping for an easier tie than Braga who will be making their Champions League debut after finished second in the Portuguese first division last season. Celtic will play the first leg in Braga in late July. The winners from these third qualifying round games will then face a two-legged play-off to get into group stages, Celtic lost at this stage last season to Premier League Arsenal 5-1 on aggregate. In what looks like Jose Mourinho last game in charge of Inter Milan the Italian champions completed a unique treble, becoming the only Italian club to win the domestic league & cup double and the Champions league in the same season. The final was more intriguing than exciting and was a complete contrast of styles as Bayern Munich tried to dominate the game, while Inter were happy to soak up the pressure and look to hit them on the break. Still especially in the first 15 minutes it looked like Bayern’s tactics could work as the played some nice expansive football and created a few half chances. They also looked to have an extra advantage when referee Howard Webb wrongly booked Chivu after a theatrical Robben dive meaning he had to tread carefully for the rest of the game. However on 34 minutes Inter struck with a well taken Milito goal. This forced Bayern to take even more chances going forward and in the 70th minute Milito struck again to all but kill off the game. This was a goal of real class and he made Mark van Buyten look flat footed as he went round him in the box to slam the ball home. Bayern continued to push forward but rarely looked like getting back into the game and despite having more possession, corners and shots at goal, only the most partisan of fans would have argued about the result. In injury time Inter brought on Materazz meaning that the game finished with one Italian on the field for Inter who have dominated this year win a team largely composed of overseas players, A fact that probably doesn’t bode too well for Italy’s chances in the World Cup this year. Tonight’s Champions league final between Bayern Munich & Inter Milan is set to attract a massive world wide TV audience, and will mark Bayern’s 8th appearance in the final (including its previous guises) making them the 3rd most successful club in the competition in terms of appearances. It will also be the first final in six seasons which has not included an English Premier League Team with you having to go back to the 2004 final for the last time they failed to provide at least a finalist. The good news is that it should be an entertaining final and at least here in the UK football fans can sit back as neutrals and enjoy the spectacle.